What Is the Easiest Exercise to Lose Inches on Thighs and Hips? When you've got a little too much fat around your thighs and hips, it's time to make some lifestyle changes. These changes include not only reducing your caloric intake, but also finding an exercise to help you burn calories. Don't spend much time looking for an exercise that doesn't require any effort -- it doesn't exist. 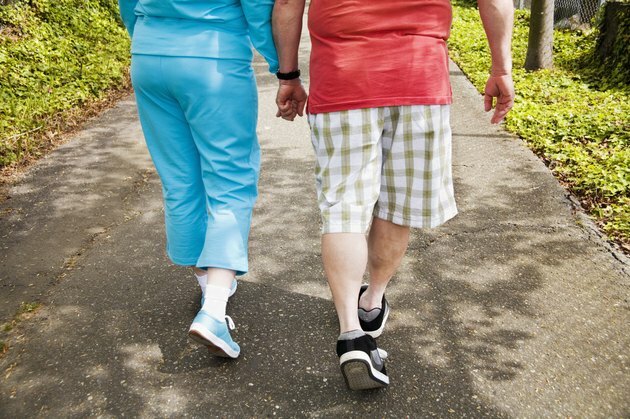 However, if you don't want to exercise vigorously, walking can slowly help you burn fat. Walking is arguably the easiest cardiovascular exercise to perform because it's something you likely do every day to some degree. Although no exercise will allow you to solely burn your thigh and hip fat, taking frequent walks can burn enough calories to result in a caloric deficit. This deficit, in turn, results in fat loss. Plan to spend at least 300 minutes walking every week to meet the Centers for Disease Control and Prevention's exercise guideline for weight loss. It's often possible to lose 1 to 2 pounds per week through regular exercise. In addition to the benefit of weight loss, walking leads to stronger bones and muscles, a healthier heart and lower amounts of stress.